Brandon Hartwig is what I hope the traveller of the future looks like. For three reasons. 1. He’s disarmingly modest. I didn’t learn until several days after we’d met that he had cycled 150,000km from Canada to China. Or that his photography has been featured in a number of impressive publications like Canadian Geographic. 2. He makes you want to travel responsibly without telling you to. His descriptions of working in community based tourism in Kyrgyzstan and traveling the world on his bicycle make you want to pick up your bike instead of a plane ticket and wave goodbye to the harms of mass tourism. 3. He has some pretty outrageous travel adventures to share. And let’s be honest, we could all use more amazing stories in our lives. From a rogue bear ripping his tent apart in Russia, to getting into a real-life bumper jeeps experience at a border crossing, Brandon has weathered just about every high and low you could dream of facing on the road. Forget trying to find something to watch on Netflix, you may want to grab your popcorn to hear this Explorer of the Future’s odyssey. Brandon has spent the past decade consistently working towards his next adventure. After lengthy stints abroad that ranged from surfing around Australia to hopping along the Gringo Trail in South America, Brandon was ready for something different. This desire to travel differently and to finance his adventures through his career ultimately led him to pursue a degree in Ecotourism and Outdoor Leadership. The ecotourism focus of his degree resulted in a three-month contract in Kyrgyzstan working in community based tourism. “There was a small article on this up and coming ecotourism destination where it’s just beginning its tourism career in the international realm. And I was thought, oh, I should go there! What can I do? It’s so undeveloped for tourism that community based tourism is kind of the first thing that gets set up. So I headed over there, contacted the Community Based Tourism Association of Kyrgyzstan, and they were super keen to bring me on. I really enjoyed it because it’s just at the grassroots level and it’s often with people in rural and poor areas who are usually marginalized in some way. They can come together in a community collective and start things like guesthouses or traditional craft workshops for women. Then they pool 1% of that back into a community fund and apply those funds to bettering their lives, whether it’s protecting certain areas in the environment or building schools and playgrounds. With this experience under his belt, the outdoors focus of his degree also required him to push the limits by leading an expedition that lasted at least 10 days in his fourth year. Download the Explorer’s Guide for Brandon’s tips on how to plan a world cycling trip + tips from all of the Banana Backpacks Explorers. This initial thought to do a longer expedition led to what would become a 7-month, 150,000km expedition by bike from Brandon’s hometown of Calgary, Canada all the way over to Beijing, China. “It all started with Mongolia. So [my partner, Kara and I] thought, Mongolia, Mongolia, what can we do? Maybe we can traverse some mountains, and then it was, oh, biking, it’s such a massive country, we can see a ton of it on bikes! How cool would that be? And then you’re thinking down the line maybe I’ll bike around the world. I’ll turn left out my front door and maybe I’ll return one day from the right. So I started looking into it and realized it’s kind of practical, we can go up to Alaska and take a 3 hour flight to Russia and then we can keep on biking. It kind of blew up from there and we told too many people and once you start telling people you have to back it up. Even once his mom had delivered him his forgotten items, things didn’t quite get off to a smooth start. Pushing through any apprehensions, they got back on their bikes two weeks after Kara’s crash and conquered the same hill she had previously crashed on. For the next two and a half months they peddled from Calgary through British Columbia, into the Yukon, and finally to Anchorage, Alaska where they would take a three-hour flight to Russia with their bikes and resume riding. We were in Kamchatka and we didn’t take out the bikes. We thought we’ll take a little bit of time off, just do some hiking and trekking around and just get used to being in a new country. So we were in this national park and we hiked in for a couple of days to these hot springs. We were hanging out in these hot springs and we go back to our tent. And I was like, oh my shoe’s moved, I didn’t leave it here. And Kara was like, nah you probably left it there that’s where we were moving everything. Then we walked around the corner and our tent and our entire campsite was just destroyed. The tent was completely shredded and knocked down and poles were broken, my air mattress ripped in half, sleeping bags were shredded with feathers floating through all the trees and forest. Some of the pockets on the backpack were ripped off. All from a Kamchatka brown bear. It’s the middle of the night, it’s around midnight, and we don’t have bear spray because we couldn’t fly it and we couldn’t find it in Russia. All we had was a little flare. So we try to gather what we can, get our food which was 100 metres away up in a tree so there was no cause for the bear to come by. But we learned after it was a bit of a problem bear. It had destroyed a quad that was in the area that was the ranger’s. They just kind of failed to tell us any of this when we first saw them. And then we’re two days into this hike, and we’re thinking how can we get out? We have nowhere to stay. No shelter, no sleeping pads. We thought maybe we could make this work but it was this northern miserable rainforest. It had rained the full two days for us to get in there. In the end we just decided to long haul it out in one giant push. I think we left at 4 in the morning and didn’t get to lay down until midnight. Just like steady walking, whatever that is like 20 hours of walking. Besides a rogue bear, humans posed the occasional additional challenge for Brandon and Kara on their journey. In spite of this experience, the majority of people they met were extremely hospitable and intrigued to see these Canadian strangers on their bikes. “We met a lot of people who had never seen a foreigner before. And there are a lot of indigenous groups up there. They were very, very kind – just wanted to say hello. A lot of them would tell us, they had grandchildren who spoke just a little bit of English, that we were the first foreigners they had ever met. It was a really, really cool experience. Ready to Start Planning Your Own Adventure? 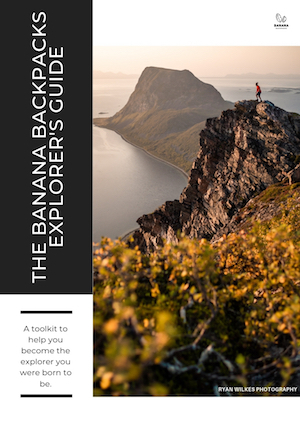 Download the Explorer’s Guide for Brandon’s Tips on How to Plan A world cycling trip + tips from all the BANANA BACKPACKS explorers. After cycling through Siberia, they finally entered the fabled country that had inspired their trip in the first place: Mongolia. “We come into Mongolia and we’re so excited. Land of the big blue sky, it’s like Alberta, so we’ll get like 300 plus days of sunshine a year. So it’s cold but we’ll get the sun and feel warm during the day. And sure enough that’s how it plays out. As soon as we cross into the border, we’re biking along and there are herds of hundreds of gazelle galloping through the steppe, they’re galloping near our bikes as we’re riding. Essentially it became this magical, beautiful place where there’s no cities, there’s just the tiny village here and then just herdsmen and their yurts and motorcycles and horses all over the place. It was so cool. This calm was a stark contrast to what they would soon encounter at the border between Mongolia and China. “We noticed these jeeps going into the border. They were lined up for kilometres and they were super old and smashed to bits. I’m surprised any of them could even drive. We get to the border and it’s all lined up with these things, so I guess you have to go through the border in these jeeps. We were like okay so that’s why they’re all here. So we put our bike in one. And we get to the border in Mongolia and he says, you gotta take your bike and go through the crossing and get your stamps and stuff, I’ll see you on the other side to do the actual crossing between the checkpoint in Mongolia to the checkpoint in China. And we go in and the guy says “you gotta put your bike through the x-ray”. And I was like, that x-ray machine is like 1 foot by 1 foot. And he’s like okay, just whatever, doesn’t scan our bikes or anything. Then he goes through and says you’re supposed to have this stamp. And he’s like eh whatever and waves us through this border. I don’t even know if we got a stamp out of Mongolia. Then we get to the other side and we’re wondering is this guy going to pick us up? So sure enough we find him. We get back in the jeep with the bikes and we get to the border and it’s getting a little crazier and a little crazier and this took 4 hours or something – there were so many people. We were like what is going on. The cars start to funnel together and I go oh, they’re obviously only letting one vehicle in at a time and I’m thinking these vehicles are getting really close to one another. And the next thing I know our driver is sideswiping the car next to us and all of a sudden we’re smoked from behind by the other jeep. And then it’s just a thousand of these jeeps crammed together, smashing into each other, trying to get into this one single lane to cross into the Chinese side. It was mayhem. It was a thousand vehicles smashing into each other. Like, wow, this explains why these things are in pieces on the other side of the border. Bears, bumper cars and gazelles aside, life fell into a new, meditative kind of routine on this journey for Brandon. “You’re almost wanting to escape routine and life when you go on a trip like this and then it just turns into a daily routine anyways. 7am rolls around I turn on the coffee, then it’s 8 o’clock I’m turning down camp, and oh I’m biking for 2 and a half hours and I’m going to stop and have a tea and some cookies, and then in 2 hours I’m going to stop and have a sandwich, and then bike for two hours and have another cake, bike for another two hours, put up camp. On repeat all the time. It was a lot of time to get inside your own head and to not think and just to be on the bike and be like wow, did 2 hours just pass? It feels really good. But the hardest thing were a couple of the cold days we had on the trip to be honest. I’ve never felt my hands or my feet go so numb that they weren’t there. And knowing that I have to keep moving because I don’t have enough food to stop for the day or oh we’ve gotta get to this next town and just the bitter cold and shaking and trying to get the pedals to go forward. Just the worry is it going to be like this every day, am I going to be able to do this for 2 months because this was already happening in September I think. It would feel so terrible to cut this short and just take the train to Beijing but we kept telling ourselves maybe we’ll get to Mongolia and we’ll get that blue sky and sunshine, so that kind of helped. And near the end of Mongolia it was kind of the same thing – with wind ripping through the Gobi Desert, we couldn’t even keep our water from freezing during the day. So we’d ride with water bottles in our coat. And you’re in the middle of the desert realizing this is your lifeline. You’re shaking water bottles to try to melt the ice out of it. That was uncomfortable. Near the end of the trip we couldn’t even cook. We’d just get in our sleeping bags in all of our clothes, all of our layers, and just lean out the door of the tent and fire up the stove. And we’d be done eating and we’d crawl into the sleeping bag and wake up and barely stick an arm out to get breakfast going. You’d only get out when it was like, okay, it’s time to bike and that’s the only thing that’s going to keep me warm. With jobs lined up for the winter season in Japan, Beijing ended up being the end point of Brandon and Kara’s 7-month, 10,500 kilometre odyssey. If you’ve been on a big trip yourself, you know how strange it can feel once it’s over, but for Brandon it was even stranger getting off the bike. Besides getting used to walking again and putting on more weight, this kind of extreme adventure impacts a person in other ways that don’t go away so quickly. Brandon has no plans of slowing down any time soon after completing this first big bikepacking trip. With his sights set on a bike trip through Kyrgyzstan, Tajikistan and the Wakhan Corridor in Afghanistan next, you’re going to want to follow along with this Explorer of the Future. You can find him and his incredible photography (featured throughout this article) on Instagram @freeluftsliv and at https://brandonhartwig.com/home. Download the Explorer’s Guide including Brandon’s Tips on How to Plan A world cycling trip + tips from all the BANANA BACKPACKS explorers.